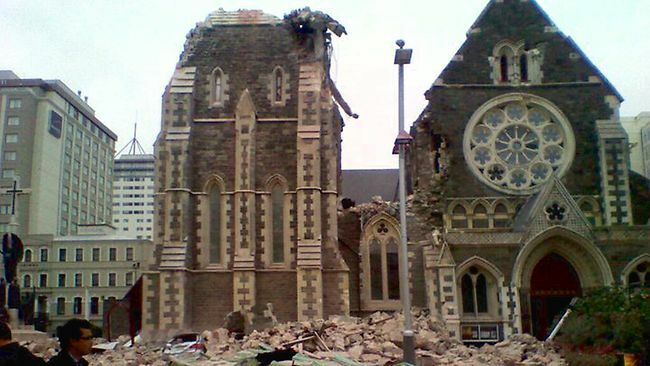 IN RUINS: The iconic Christchurch Cathedral lost its spire in this afternoon's magnitude 6.3 earthquake. Christchurch, New Zealand, Feb 22 – New Zealand’s second-largest city has been destroyed in a magnitude 6.3 earthquake, with concern being shown for the fate of Zealandia. At 12:51pm NZDT, an earthquake centred 10km south of Christchurch and at a depth of 5km rocked the city already weakened from last year’s 7.1 quake. There has been major devastation in Christchurch’s Central Business District, and it has been confirmed that at the time of writing, 65 people had been killed, although this toll is expected to rise. Aftershocks have been plaguing the city in the hours following the quake, with aftershocks as high as magnitude 5.7. Many feel that this quake could be an even bigger psychological blow to the crippled city after trying to repair itself after the devastating September 4 earthquake and the Boxing Day aftershock which ruined the chances of many businesses of making sales. It has been deemed New Zealand’s darkest day, and as night falls on the ruined city, many are praying tonight that their loved ones are safe and well. Many buildings have telescoped, crushing anything between levels, and this afternoon the city was bathed in dark grey smoke following a fire at a television station. There have been reports of liquefaction throughout parts of the city, and many roads have been closed, including the Lyttelton Road Tunnel in the city’s south. However there are concerns about King Anthony this evening. Due to the breakdown in electricity networks and cellphone services, contact has not been established with the Kingdom of Zealandia. While it is deemed likely that he has been left unscathed by this disaster, Premier Anderson has stated “we don’t know what’s going on down there, we just hope he’s okay.” Many are hoping that Anthony and his loved ones have survived the quake and are in a safe environment, but some believe that Denton may have been severely damaged. It is believed the Premier may start an appeal for donations to go towards earthquake recovery. You can follow updates on the situation via Stuff, the New Zealand Herald, TVNZ, or via a TV3 live broadcast. I hope Anthony is alright! I tried to contact Anthony (via Skype) this afternoon, but as you said, electricity and telephone lines are down. I really really hope Anthony, his family and friends are alright. At this moment and at this distance we can’t do much more than hoping.